Extreme Precision located in San Jose, Calif., is a production job shop that manufacturers parts for a variety of industries, from aerospace to medical to high tech. 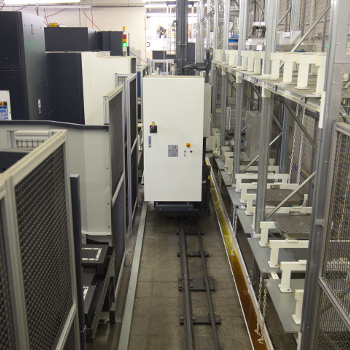 Extreme Precision replaced its previous so-called high-end Japanese horizontal machine with a Makino A55E horizontal machining center. The speed, accuracy and rigidity it provided enabled the company to take on a larger variety of projects. All of these machines were put into an automated machining cell together with the shop’s existing A55E. With both 4- and 5-axis capabilities in its automated cell, Extreme Precision gained the flexibility to manage any job that comes through its doors. The automated machining cell has helped the company maximize workflow. The system enables Extreme Precision to minimize inventory and work in process by approximately 50 percent because it no longer has to keep large batches of inventory on hand to manage repeat orders. This approach frees up cash flow and lessens the impact of fluctuations in material costs. Part costs remain the same, no matter how many parts are ordered. Because the pallets are interchangeable between both the 5-axis vertical and horizontal machining platforms Extreme Precision can maximize the benefits of each machine in the automated cell. The 4-axis horizontals are used for roughing operations, and the 5-axis features and finishing operations are completed on the D500. The company can now use shorter tools at higher feedrates, even in complex parts. In fact, Extreme Precision has doubled and tripled feedrates over previous technologies, significantly boosting both speed and quality. It can hold tolerances of 0.0001-inch all day long while reducing cutting times. Operator intervention has been reduced from having a person assigned to each machine to one person managing three machines simultaneously. With the automation, the company has seen average cycle-time reductions between 50 and 70 percent, compared to the stand-alone equipment. With shorter lead-times and reduced inventory, Extreme Precision even paid off the system in a year, quickly seeing its return on investment.